There’s no doubt that the Road Warrior left its mark on cinema in the eighties. Setting your film in a world where there aren’t many buildings, even less people and everyone is dressed in a mishmash of styles means you can make a movie for cheap. So naturally it became the go to genre for a lot of cash strapped film makers looking to make some profit. No one seems to have quite taken this particular genre to heart like the Italians. 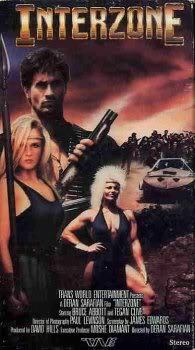 Dozens and dozens of ‘Road Warrior’ styled films came out of Italy in eighties, quite a few of them are dull slogs through a brown landscape. A few have some moments of inspired insanity. Early into ‘Interzone’ we are introduced to Swan (Bruce Abbott of Re-Animator fame), he’s a cocky dude with a cool leather jacket and one glove. He catches some thugs discussing hidden treasure being sought by some local warlords; a guy with a weird accent named, Balzakan (John Armstead) and a musclewoman named, Mantis (Teagan Clive). It seems the treasure is hidden in a monastery, the residents are conflation of western and eastern style monks and of course they are psychic. Unfortunately for Balzakan, Mantis and their horde of semi-unsightly mutants, the monks have a force field around their home, but it’s only a matter of time before the horde find a way through. The monks send one of their own, a guy by the name of Panasonic, to find two other heroes, a man, and a woman, who are destined to defeat the gang before they can steal the treasure. Panasonic and Swan meet up, become best pals, free a woman from a slave auction, Tera (Beatrice Ring) and set off to find a way to defeat Mantis and Balzakan. ‘Interzone’ is a real rarity in that it’s an action film that occasionally veers off into completely silly moments that are both intentional and actually funny. Things like everyone’s awe and confusion over a toothbrush, to a full on ‘Nine ½ Weeks’ (1986) sequence with our hero being manhandled by Mantis and getting raw eggs, sardines and whole bananas shoved in his mouth. There is a wonderful moment reminiscent of Ash’s fight in the pit in ‘Army of Darkness’ (1992) except after all the buildup of the monster, the fight is about thirty seconds long. It’s also not afraid to throw in some unexpectedly grim moments, but these are used sparingly and manage to add a little variety to what is an otherwise extremely light film. The movie was obviously shot on the cheap. The battle cars, a cliché of every post-apocalyptic movie, look like they could fall apart at any moment. The mutant army consists of about twenty-five slightly dirty guys and one hunchback. The less said about the monster in the pit, the better. The fight choreography is all over the place, ranging from unbelievably terrible to some pretty decent brawls near the end of the film. It feels like there is a lot of love put into this movie, fun moments, and plenty of low budget action. It’s definitely worth checking out.